Room #484 in the historic wing of the Royal Hawaiian Hotel was the perfect way to wrap up my “spring break.” It had a wonderful view of Diamond Head and the ocean, reminding me what it must have been like when the Matson ocean liners, such as the Malolo, brought West Coast tourists to the Royal Hawaiian Hotel in the late 20s. (We have collected colorful dinner menus from those journeys, framed them, and hung them on a wall in our kitchen at home — a daily reminder of “good times”). 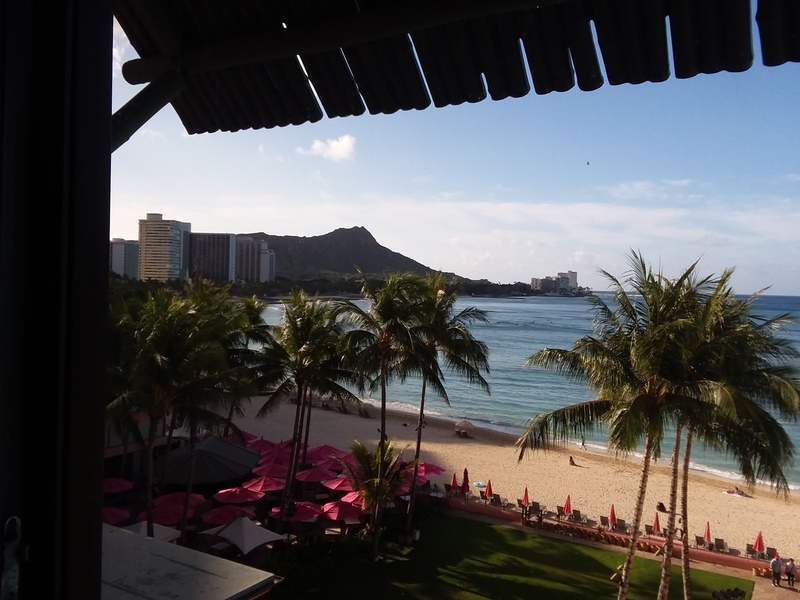 In then’30s, Hawaii Calls began broadcasting Hawaiian music from the Royal Hawaiian. Movies such as Waikiki Wedding starring Bing Crosby made songs like Sweet Leilani and Blue Hawaii famous. In the ’30s commercial air travel came along, replacing the ocean liners. In 1936, Pan American World Airways inaugurated its Clipper passenger service from San Francisco to Honolulu, using the long-range flying boat, the Hawaii Clipper. In 1970, Pan Am flew the first commercial flight to Hawaii in a four-engine Boeing 747, followed by Continental and United in the same year. My first plane trip ever was a flight to Hawaii in the mid-’70s to visit my childhood friend in Honolulu on a United 747″Friend Ship” from SFO. It was awesome. The upper deck was a lounge. Later, my wife and I flew to Hawaii on a Continental Airlines DC-10, with a long L-shaped bar for in-flight libations. These were dubbed “Pub Flights.” The motto: “On Continental Airlines, we really move our tail for you” (an inappropriate tagline nowadays). But that glamorous era of flying came to an end: United flew its last 747 this fall with retro flight attendant uniforms and menus. Now small, more fuel-efficient, twin-engine jets have replaced most flights from the Mainland to Hawaii — supposedly in the name of “progress.” In 1980 an FAA administrator said: “It’ll be a cold day in hell before I let twins fly long haul, overwater routes.” But it happened. In 1989, the FAA approved twin-engine flights to Hawaii, ushering in an era of cramped narrow-body flights to the islands. My longtime friend at United, a Boeing 747 captain, joking called the 737s that fly to Hawaii nowadays “toy airplanes.” From a passenger’s point of view, at least mine, that’s not progress. The plane flies slower than a jumbo jet and the passengers are more cramped together. There is no lounge or stand-up bar; just two small lavatories. This afternoon, I’m going to fly from Honolulu to Oakland in a Boeing 737 from Alaska Airlines. Yup, Alaska. The Seattle-based airline has been flying to Hawaii for just over a decade. ““I never thought Alaska would fly to Hawaii,” as one flight attendant put it. Now after completing its acquisition of Virgin America this week, Alaska Airlines is one of the biggest carriers to Hawaii, along with United, American and Delta. 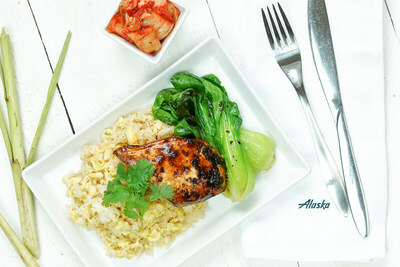 Alaska Airlines unveiled a flavorful new First Class menu inspired by the West Coast food scene. I upgraded to first class for this trip, thanks to frequent flier miles. It’s an excellent service. The menu features fresh, local ingredients, such as a steak salad with green papaya, mint and lime wedges, on Schönwald serving pieces. The flight attendants hand out Microsoft tablets for watching movies. Times have changed for ground transportation too. I’ll use my smartphone to book a ride on Uber. But some things don’t change: I’ll ride home on an Amtrak train to Sacramento, the same route as the California Zephyr, whose roots date back to the ’40s. It’s scenic but slow.